Andrew Mitchell’s Global Canopy Programme has helped people around the world understand the role that rainforests play in regulating the environment and promoting rainfall well beyond their boundaries. Now, as a senior adviser to impact investment group Ecosphere Plus, he’s helping to funnel investment dollars into conservation projects around the world. 13 July 2017 | People who know Andrew Mitchell don’t bat an eye when he breaks into a rousing gibbon whoop in front of a packed lecture hall – or when they see him poring over papers with Prince Charles in Clarence House, or talking trees with indigenous leaders deep in the Amazon, or clutching a blow-dart pipe in his hand, ready to spear a balloon from 100 paces while school kids cheer him on. Wherever he is and whatever he’s doing, this Oxford zoologist is trying to communicate the science behind forest canopies – and the importance of protecting forests and the services they provide. 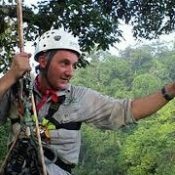 His Global Canopy Programme has evolved from a scientific institution pulling together the latest research on forests into one of the world’s leading think tanks on accelerating the transition to a deforestation free global economy. Last year, they teamed up with the Stockholm Environment Institute to launch TRASE, which is a new platform that tracks the global movement of commodities that cause deforestation, and Mitchell recently became a Senior Adviser to Ecosphere Plus, which is an impact investment group that funnels money into sustainable land-use. When he founded GCP in 2001, Mitchell had already spent decades studying forest canopies in Asia and South America and trying to both convey his sense of wonder and advocate for forest protection. His work in and around forests included participation in the scientific expeditions Operation Drake and Raleigh, establishing Earthwatch Europe, and spreading the word through numerous books, articles, TV and radio appearances. Now, Mitchell and GCP have taken their understanding of forest science into the arenas of economics, policy, and finance to figure out how commerce could work for forests, not against them. Mitchell’s view of forests started out on the forest floor when he was charged with identifying primate species in the forests around Mt. Mulu on the island of Borneo on a 1978 expedition with the Royal Geographic Society. Mitchell became one of the pioneers of canopy research. First, he scaled up into the trees with ropes. In the 1980s, he developed aerial walkways allowing researchers to get an even closer look at canopy species and phenomena. Climbing into the canopy came with surprises. At first, the amount of species, including ones no one had seen before, found in this leafy world was astounding, Mitchell says. Some surprises were less welcome. Along with never-before-seen species, the way in which forests interact with the atmosphere was an undiscovered field. In 2002, he climbed 60 meters in a ‘flux’ tower high into Amazonian canopy with eco-physiologist Antonio Nobre, who worked on the Large-Scale Biosphere-Atmosphere Assessment project. They looked at the carbon dioxide meter and saw the reading: 382 parts per million of carbon dioxide in the atmosphere, uncomfortably close to the level of 450 parts per million the Intergovernmental Panel on Climate Change (IPCC) has set as the threshold level above which consequences from climate change would be dangerously severe. Since then it’s risen to 410. So how can you make people care about rare bugs and carbon dioxide, when it seems all they care about is money? Mitchell and GCP have put forward the concept of forests as eco-utilities which regulate rainfall, pull and store carbon dioxide from the air, and deliver all of the ecosystem services provided by biodiversity which underpin food, energy, and climate security for humans. To understand the economics that might drive forest protection, GCP starts with forest science. “You have to look at the science in order to work out what the forests are doing that might become valuable,” Mitchell says. Mitchell’s early enthusiasm for forest canopies wasn’t always met with support. “When we first started this, there was a great deal of indifference,” Mitchell says. While no NGO has complete security in terms of funding, Winser says, GCP’s footing is now much more solid – and Mitchell, “one of the world leaders in forests,” wields impressive influence in the upper levels of policy and corporate circles, as well as conservation ones. Mitchell describes growing awareness of the economics of climate change and the role that deforestation plays in carbon emissions – particularly as explored in studies like the 2006 Stern Review on the Economics of Climate Change – that has made his work easier. Many businesses get their products from land where rainforests used to grow, from soy to feed chickens and pigs, from beef cattle raised in the Amazon, to vegetable oil made from Asian palms. These products are long-haul travellers that then appear in markets around the world. “You and I, every day without knowing it, are eating the Amazon,” he says. As a response, GCP launched the Forest-Footprint Disclosure Project in 2009, which encourages companies to examine how their operations and supply chains affect forests. To kick off the project, Mitchell wrote to CEOs of more than 600 companies that GCP believed had sizable forest footprints, requesting that companies complete a questionnaire on their use of five main commodities: beef, soy, biofuels, palm oil, and timber, that were linked to deforestation. It wasn’t just a letter. Mitchell had called for support, and, to his surprise, investors responded in force. During what Mitchell calls “the worst financial crisis the world has probably ever seen since the Depression,” investors with a total of almost US$3 trillion in holdings backed his call for forest disclosure before the project launched. They wanted to know what other risks were out there that they should know about. Mitchell attached a list of these investors to his letter. “Their support was an amazing vote of confidence,” he says. After three years, he merged Forest Footprint with the Carbon Disclosure Project. Today it is known as CDP Forests. In 2016, almost 200 companies disclosed and investors managing assets equalling US$22 Trillion now back his call for forest disclosure. Mitchell hopes the project will drive development of worldwide best-practice standards for companies that do source their products from rainforests. That work then morphed into the Forest 500, which ranks the policies of the biggest governmental, corporate and investors in the deforestation economy, to reduce their impact on forests and works in tandem with the Forest Trends Supply Change initiative, which tracks the progress companies report on their progress to reduce deforestation related to the “big four” commodities driving most deforestation – namely, palm, soy, cattle, and timber & pulp. Colleagues say Mitchell’s engaging personality has turned detached government officials and CEOs – as well as researchers – into forest fans. Canopy scientist Margaret Lowman recalls inviting Mitchell to the first international canopy science conference, held in 1994 in Sarasota, Florida, as a keynote speaker. Mitchell stood on stage and unveiled “this amazing plan that he had worked out, where we’d have canopy stations with a balloon, with a walkway, with a tower, with a crane, with all of these cool gadgets dotted throughout the forests,” Lowman says. Then he put up a map of where he wanted these canopy stations: everywhere. The scientists in the audience started laughing. Anyone else might have walked off the stage, disheartened. “His charismatic personality carried the day,” says Lowman, who is now on GCP’s steering committee. “Andrew just charged right ahead, full steam – and carried the crowd right along.” And at the next conference, dozens of scientists were advocating for the same canopy stations that they’d been skeptical of a few years earlier. Mitchell’s vision for 20 such “Forest Canopy Observatories” to be installed globally by 2020 has already been exceeded, with three planned in China alone. Mitchell says while his mission to protect forests hasn’t changed, his audience has expanded. In 2007, Prince Charles approached him to find a way to protect rainforests. Mitchell wrote the plan for and advised the Prince’s Rainforests Project. This both promoted awareness of deforestation and advocated an “Emergency Plan for Forests” and called for some US$20 billion of financing to rainforest nations ahead of REDD. The resulting meeting at St James’ Palace in 2009, Chaired by the Prince of Wales and attended by 18 Heads of State, helped to foster an agreement at the Copenhagen Climate talks, and US$5 Billion for forests, the largest injection of cash into conservation the world has ever seen. The pressure to help forests fast is what drives Mitchell to address deforestation on multiple fronts. Along with an ability to transform complex canopy science into a story that’s understandable in boardrooms and remote villages, Mitchell has a few other tricks up his sleeve. On a later expedition with Winser and the Royal Geographical Society to Malaysia and the forests around Mt. Mulu, Mitchell learned how to imitate forest primate calls. The two researchers also worked with the nomadic Penan people, learning how they lived sustainably within the forest – and how to shoot darts out of traditional blowpipes. When Mitchell spoke with the Ecosystem Marketplace, he was embarking on an adventure: a trip to Manaus, Brazil, where he had invited key representatives from indigenous and other communities from across Amazonia to discuss how they could be compensated for the ecosystem services they help to maintain. One of the great gaps, Mitchell says, is in understanding what people will do, once they’re given the means to protect forests. Mitchell is often on the road stirring up princes and presidents to protect forests – or learning more about forests from the people who live and study there. His new focus is on the financial sector, and how to transform the money supply that is destroying nature into one that sustains it. “The movement of money controls everything, and that includes deforestation.” he says. “The problem is, banks, investors, your pension and mine are not incentivised to do the right thing so, often, they do the reverse.”With UNEP’s Finance Initiative, at the Rio Earth Summit in Brasil in 2012, he launched the “Natural Capital Declaration”for the Financial Sector. Today it’s called the Natural Capital Finance Alliance and has 40+ C-Suite signatories from major financial institutions worldwide. NCFA is creating the tools on deforestation, water risk, and other environmental impacts that he hopes, one day, will be used by investors everywhere to better understand not just financial capital but their use of natural capital as well. But when he’s home, you might find him strolling through the oak, ash, and sycamore trees in Wytham Woods near Oxford University, where Mitchell is an Emeritus Fellow of Green Templeton College. “When Brazilians come here and I show them my wood, they laugh,” he says.